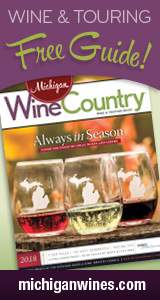 This giveaway has ended — and so has the 2018 Michigan Wine Month Giveaway! Thanks to all who participated! • $50 gift card redeemable at either of Black Star Farms' two Traverse City area tasting rooms and online. • $50 in Hearth & Vine Dining Dollars: Enjoy wood-fired pizza and other farm fresh fare at the Hearth & Vine Café, located on BSF's Suttons Bay winery estate.